I wanted to have a similar flow functionality as Memo's ofxMSAFluid: http://memo.tv/ofxmsafluid. So it made sense to return the result. Here it is! With a little run through in the attached video. i think this should be able to be optimized by using two video cards. one card for the fluid images and the other for particles and meshes. not sure how else it could be optimized. everything is in cl. maybe making the image resizers in open cl and queuing up your flow images in parallel might improv performance. either way nice work my friend. on a different note ties... my friend in japan sent some files to my computer. i told her to put the files in my computers dropbox. she put them in the application drop boxes folder which nuked everything i had in dropbox including some concept proposals of yours from last year. just thought i would let you know. i hope she didn't cause any problems. No Worries Dust, I loose stuff all the time, although it's probably somewhere on my systems ;). What kind of system are you using? I had some similar results on a recent macmini. Thanks for this excellent sample! It is a master composition of OpenCL. thats on a 3 year old mbp with dual 9600M and 9400M cards. interesting enough it doesn't run at all on my air with a 320M card. which does support open cl and ran cl particle patches fine in snow leopard ? kind of bums me out actually, i have already had to send it back to apple once for repair. i picked the 320M as a base model to test CL apps with. that way i could optimize my apps to run on non pro machines. I've been following your blog, and was dreaming of it. On a 2009 MBP 13" it runs at 20-23fps in 128... It IS fluid. I am getting instability: freezes and crashes with this on a 2010 iMac 27 with i7, SL 10.6.8. Forgot the gpu but it's supposed to be OpenCL capabable I believe. So, what's the protocol? 1) remove all plugins, 2) try in both 32 bit and 64 bit modes, 3) reboot, what else? Funny thing is, it worked once or twice for a bit. Other symptom I haven't seen before is a frequent blank popup window upon starting the viewer window. This Composition does so much OpenCL that i absolutely discourage everyone to run it from CPU. Even my solid and reliable (but slightly outdated) MacPro freaks out big time. If your G card does support CL (CL_DEVICE_GPU) try deleting parts of the comp to see where the problem is. Try running only OpticalFlow, then add Fluid Sim and last the Particles. I would really like to know of there are any bugs so i can improve the patch. Re: AR in CL: generating nice textures / shaders? I would like to work on the visualization of the particles. I have the feeling i should use GLSL for this, but i never worked with this language / QC patch. Anyone has some pointers for me where to start? If you are actually using the "DropBox" -- then I believe even if something got nuked -- you should be able to login to your DropBox account on the Web and "roll back" the changes. Kind of like a "version history" -- it probably has a limit on how long and how many new uploads you make, but if you get to it quick, you should be able to re-download even overwritten files of the same name. cool thanks good to know. seems like a handy app dropbox. i don't collaborate enough to make that much use of it but now that i see you can restore files and roll back, it becomes more useful. sort of like a mini cloud time machine or something. @ties eiPixels folder has been restored. This looks phenomenal from the video. And the ball is sparks blue particles... can't wait to see it work on my machine but unfortunately it crashes immediately before QC can even open. Tried disabling cache as per your image posted. Hoping there is a solution. This looks phenomenal from the video. And the ball sparks blue particles... can't wait to see it work on my machine but unfortunately it crashes immediately before QC can even open. Tried disabling cache as per your image posted. Hoping there is a solution. What is your machine and configuration? OS version, CPU, GPU? I use Dropbox a ton for collaboration with Swiftlikeninja. The revisiting stuff is awesome, plus having our work web accessible is a huge plus. I could definitely build a similar setup myself, but it's hassle and worry free. Okay, I am f*****. 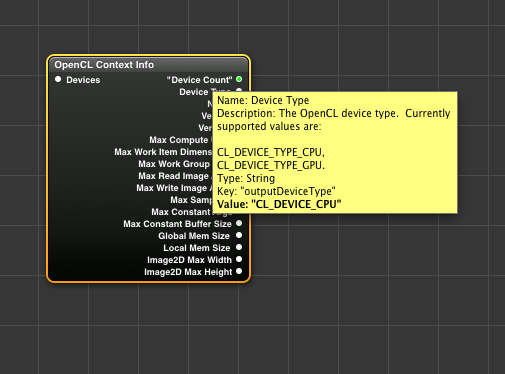 QC reports 1 opencl device "CL_DEVICE_CPU". However, I am upset because the machine has a Radeon 4850 which is supposed to be supported (http://www.apple.com/macosx/specs.html) and runs OS X 10.6.8. I did a reboot, just to make sure some glitch hadn't disabled the gpu. No joy. Is this something to take to Apple? The quartz-dev list maybe? I started digging into this a little more, because I was interested in seeing how the particle engine part of it would work with the fluid sim that I use. One thing that I noticed is that it seems as though a great deal of what is happening in the particle system velocity ends up being dictated by the initial optical flow. At first, when I started looking at the particle engine part, I couldn't figure out why I wasn't getting results from using the flow from my own liquid sim. I've added two parameters to your composition, to influence the weighting of the optical flow image, vs. the fluid image in dictating the position of particles. Ultimately, what's coming out of the liquid sim itself is a bunch of vectors that dictate the flow, so it can be constructive to amp that up, or diminish it, and let the initial force of the optical flow prior to the liquid sim have more influence. I have left the liquid sim part as is. With this, the particles are more gooshy and move in a more liquid like manner. What were you thinking about... do you mean for texturing of the particles, or something different? I like the idea of having a couple of parameters that result in different particle behaviors. It's more or less what i did with the magic particles video. I took it out of the comp to keep it as straight foreword as possible. 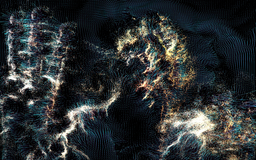 It's indeed visually rewarding to play with these particle forces / velocities. I'm thinking about a sort of glassy feel to the particles, with a simple light setup and maybe some refraction. I still have my hopes up for Lion, but this could be just wishful thinking. I posted my concerns to the QC list, and also did a search on said list. According to an earlier post by C.Wright QC requires some additional features beyond OpenCL standard support and only certain (unnamed) cards support the (unspecified) required extensions. Other's have suggested that these mystery requirements are "image support" or "texture buffer" support. But neither of these terms clearly map to extensions named in the OpenCL 1.0 and 1.1 Specifications, as far as I can see. In any case, C.Wright makes it clear that other, non-QC, applications may use an OpenCL supporting gpu, even if QC's unspecified secret additional requirements are unmet by the card. Anyone (inside Apple or outside) who can shed specific light on this? Answers could help customers make informed choices on hardware purchases. Hoping Lion might improve but unlikely eh? Are there any possible solutions for this machine? first test is on mac pro with ATI Radeon HD 2600. the card isn't supported however the cpu render of this patch on a dual quad core intel xeon with 10gb of ram. @128 resolution i'm getting 18-20fps with everything turned on. @768 resolution with everything turned on i'm getting 3 to 5 fps. second test is on iMac with AMD Radeon HD 6970M with CPU of 3.4ghz iCore7 with 8gb of ram. will not render at all. no mouse no video. simply crash o' la. will test some more systems later got to run. I'd really appreciate it if somebody could build this composition into an App using Quartz Builder and post it. I'll take it into the Apple Store and try it on every machine they can throw at it. Mini to Mac Pro. I'm on Leopard so can't do myself. It' so frustrating to be uneasy about spending on the latest hardware (was thinking latest MBP 17" or latest 27" iMac). If it weren't for Sandy Bridge CPUs and TB i'd be down for an Nvidia 512MB GPU MBP reconditioned/2nd hand for sure. So I just took the .qtf file into the local reseller and open it in Quicktiem Player app. Crashed QT app on every Mac there. Nothing with a NVidia GPU. The last affordable mac that will play this comp is the last gen MacMini (mid 2010) It has a Nvidia 320m. I have one here and it performs well on low settings, 25fps at a resolution of 128.
here is app i built in lion 64bit with apple llvm compiler. 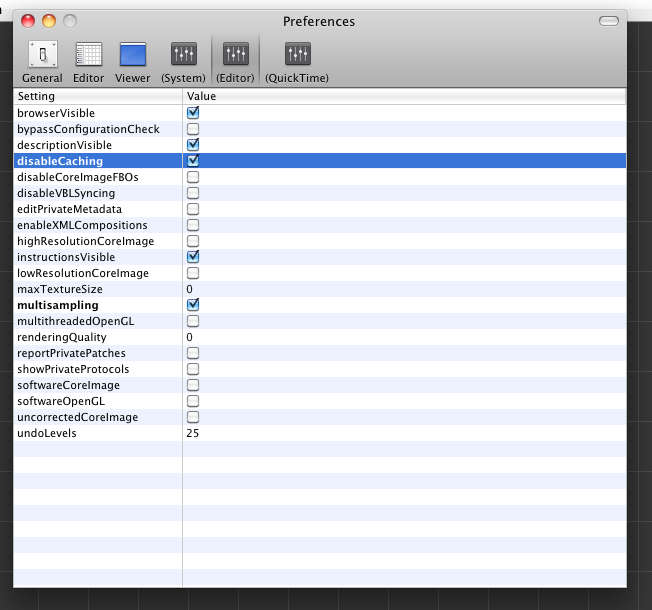 tried making a quartz builder app but it doesn't seem to be working in lion with this patch. running a qtz file in qt doesn't work anymore unless you have quick time 7 installed. 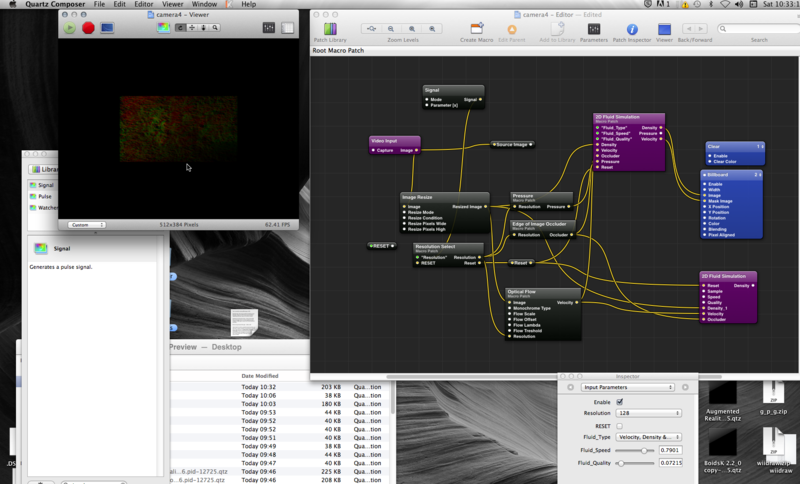 Thanks Dust, Note that I did take in a few simple demo .qtz compositions of my own and they all ran okay in QT Player app (presumably Lion it was an Apple reseller so I assumed it was Lion). 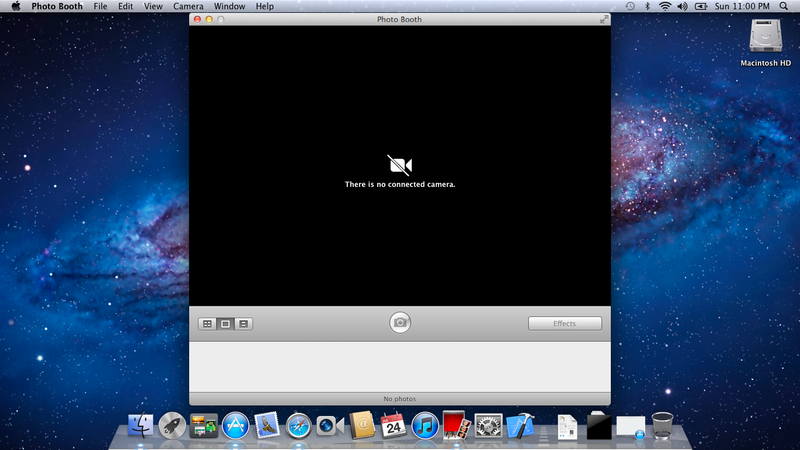 You get a dialogue saying the program that made the file is not installed but you can run in Quicktime Player if you want to. Like I said some simple .qtz files worked fine not sure which version of QT the player was using. Thanks for the example dust, I tried creating a QB application using m.oostrik's original, but found it only partially functional. Thankfully I find other compositions don't fare quite so badly in QB, even if depending upon one OpenCL kernel or another, bit of a mystery as to why a seemingly supportable input to QB should produce such a partial output. Thanks also for the skeletal project. Thanx for the app Dust! Tried to find out how it works , but i don't get the new Xcode. Can't seem the find any code that links to the quartz composition. Where is the comp anyways? Can we do a Skype Session? I instantiated the comp into the xib. so there is no need to load it from a file just needed to add the qc framework. You can do a lot of things with story boarding now. Story boarding being formally interface builder. you can do thing like dragging an object to your app controller and having the property methods generated for you etc... yeah I'm down for a Skype anytime. i hear you, it is really quite unfortunate and un-amusingly ironic that the entire current line of Macs, ship with AMD graphics and in turn cannot run the composition's OpenCL patch. at one time i thought QC was the tool to develop OpenCL in, but given the woes with AMD graphics, there must be some other environment this is done in? it's crashing down on MacPro, ATI Radeon 5770. don't anybody knows why?? Thx! On 10.8, suspect the component part, Density OF Mask patch set, as the Optical Flow worked in use inside the Particles Boids composition. I'd also suspect the Occluder and Pressure OpenCL patches. They also failed in being reusued elsewhere. Haven't checked them in painful isolation as yet but that's what I think would help figure what wasn't working even when not in any odd mix up in QC. Probably down to Graphics Driver updates since the composition first got published. Just checked these OpenCL kernels in isolation and found that they all work well in isolation, all excepting the 2d Fluid Simulation macro patch, then again, that might well be due to the resolution not being transferred correctly - like maybe its sampling 256 but set to 128 Resolution. Just a thought. The correct resolution did sort that problem out. Current conclusion, the OpenCL Macros don't play well together, suspect some mismatch of resolution or image type, unscaled, unsized or something. Given that trying to work the original or forked AR .qtzs, I'll approach this as a rebuild, adding them back together, step by step. Just rebuilt the item and it breaks down at the Particles patch. Still to employ the BrushImage patch. Everything else works. See attached example. Might try replacing the Particles patch with another stable on its own Particles patch and see if that works nicely. ooops, I missed this post, but thank youuu!! did anybody make some progress on this already? it's completely freezing whole system (mountain lion) if i connect any "rendering macro" from original M.Oostriks patch (particles, velocity flow, velocity fluid) I'm running MacBook Pro retina, 10.8.5. thanks for any help in advance!